Kimi Raikkonen continuará compitiendo este año en el Mundial de rallies y lo hará con su propio equipo, bautizado como ICE 1 Racing. Tras frustrarse las negociaciones para su regreso a la Fórmula 1, se especuló con su posible retirada del mundo de la competición, especialmente tras la muerte de su padre antes de Navidad. 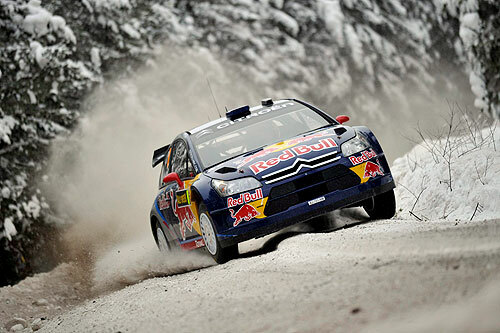 Sin embargo, Kimi ha demostrado sus ganas de seguir en primera línea de combate solicitando una plaza para el primer Rally de Suecia (13 de febrero), donde se pondrá al volante de un Citroen DS3 WRC, propiedad de su nuevo equipo. El periódico francés L’Equipe ha asegurado que el equipo de Raikkonen se ha comprometido a disputar 10 de los 13 rallies previstos para el calendario de 2011. En su primera temporada en los rallies Raikkonen alternó decepcionantes abandonos con grandes actuaciones como en Alemania, donde venció en uno de los tramos. También acabó quinto en el Rally de Turquía. PD. Creo que si alguna escudería hubiera estado dispuesta a pagarle lo que pedía, Kimi hubiera vuelto a la Fórmula 1 con los ojos cerrados. Yo que Raikkonen ponía unos autos de choque. Siempre se la pega. No se llega igual un F1 que un coche de rally. Ya sabemos que un F1 no se maneja igual que un coche de rally, ¿Y qué? Raikkonen no cobra entrada para sus espectáculos. Sigue en el candelabro… Clica sobre mi nombre. SI SIEMPRE QUE ME POGO A VER LOS RALLIES SE SALE DE LA PISTA O SE LA DA. MEJOR QUE LO LLAME SEGUROS GENESIS O ALGO ASI. Que vuevla a la F1, hecho de menos sus batallas con Alonso. Raikkonen deberia correr en F1 lo demás es como un pasatiempos de resultado muy poco beneficioso. Yo tengo entendido de que este blog es de formula1 no de rallies. Así que con sus millones de euros el chaval se monta su propio equipo para hacer el payasete y conservar algo de relevancia. Pues muy bien, pero sin tener patrocinadores no va a durar ni 3 años. Es mi heroe! un tipo de hielo que gano un mundial por casualidadd y al que en realidad no le mola conducir un F1! Iíd have to check with you here. Which isn’t something I normally do! I get pleasure from studying a submit that can make folks think. Additionally, thanks for permitting me to remark! Hi and thanks for publishing this. It addressed a large amount of questions in which I had. Thank you. whoah this weblog is wonderful i really like studying your posts. Keep up the good work! You know, many people are hunting round for this information, you can help them greatly. I like this weblog very much, Its a rattling nice berth to read and incur information. What’s Taking place i’m new to this, I stumbled upon this I have found It absolutely useful and it has aided me out loads. I hope to contribute & aid other users like its aided me. Good job. Thanks for some other informative site. The place else may I get that kind of information written in such a perfect method? I have a mission that I’m just now running on, and I have been at the glance out for such information. I just needed to say that I found your blog via Goolge and I am glad I did. Keep up the good work and I will make sure to bookmark you for when I have more free time away from the books. Thank you! You can count me in for a Digg. Thanks so much for posting this on your site! I hope you would not mind if I posted a part of this site on my univeristy blog? Thank you for the good writeup. It in fact used to be a amusement account it. Look complex to far added agreeable from you! However, how can we be in contact? Once I initially commented I clicked the -Notify me when new feedback are added- checkbox and now every time a comment is added I get 4 emails with the same comment. Is there any approach you can take away me from that service? Thanks! I just needed to say that I found your blog via Goolge and I am glad I did. Keep up the good work and I will make sure to bookmark you for when I have more free time away from the books. I really have to say thanks! A thoughtful insight and ideas I will use on my website! You’ve obviously spent a lot of time on this! Well done!! I usually don’t normally post on many SEO blogs, however I just has to say thank you for Raikkonen crearÃ¡ su propio equipo de rallies Bravo, Fernando – FÃ³rmula 1… keep up the amazing work. Ok regrettably its time to get to school.